New York: Harcourt, Brace & World, Inc, 1968. First edition of this groundbreaking contribution to linguistic theory. Octavo, original wrappers. Signed by Noam Chomsky on the half-title page. In near fine condition, small name. 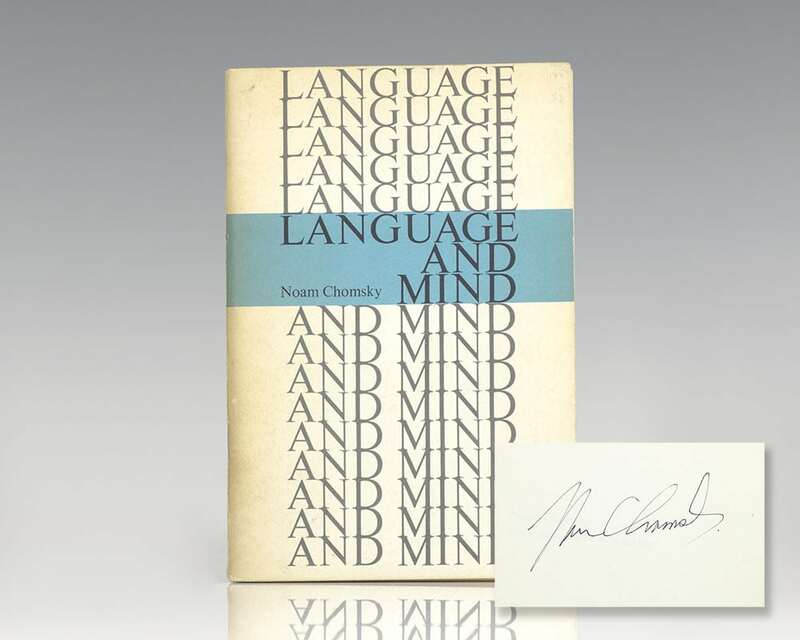 Chapters 1-6 present Chomsky's early work on the nature and acquisition of language as a genetically endowed, biological system (Universal Grammar), through the rules and principles of which we acquire an internalized knowledge (I-language). Over the past fifty years, this framework has sparked an explosion of inquiry into a wide range of languages, and has yielded some major theoretical questions. The final chapter revisits the key issues, reviewing the 'biolinguistic' approach that has guided Chomsky's work from its origins to the present day, and raising some novel and exciting challenges for the study of language and mind. Cambridge, MA: The MIT Press, 1965. First edition, early printing of this landmark work in generative grammar, which introduced certain technical innovations still drawn upon in contemporary work. Octavo, original cloth. 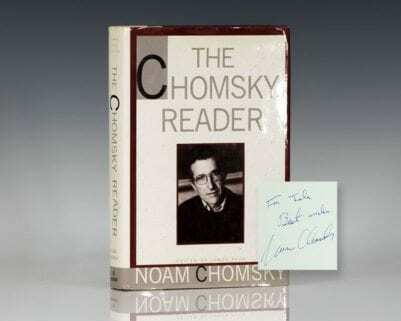 Signed by Noam Chomsky on the title page. Name to the front free endpaper, near fine in a very good dust jacket with some chips and tears. Later printing of the Chomsky’s landmark first book. Octavo, original wrappers. 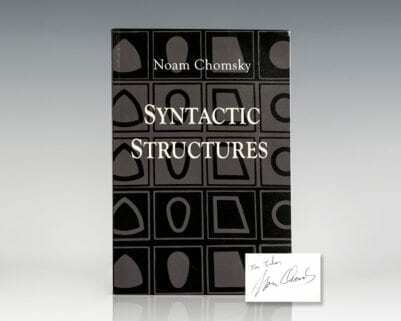 Inscribed by Noam Chomsky on the title page. In fine condition. First edition of this landmark work in generative grammar, which introduced certain technical innovations still drawn upon in contemporary work. Octavo, original cloth. Signed by Noam Chomsky on the half-title page. Near fine in a very good dust jacket with some chips and tears. Rare, especially signed. New York: Pantheon Books, 1977. First edition of this work based on conversations with Mitsou Ronat. Octavo, original cloth. Signed by Noam Chomsky on the half-title page. Fine in a near fine dust jacket. Jacket design by Robert Cuevas. Translated from the French by John Viertel. American Power And The New Mandarins: Historical and Political Essays. New York: Pantheon Books, 1969. First edition of Chomsky’s first political book. Octavo, original cloth. Signed by Noam Chomsky on the title page. Bookplate to the front free endpaper, fine in a near fine dust jacket with a touch of shelfwear. Chomsky, Noam and Howard Zinn. The Pentagon Papers. The Senator Gravel Edition, Volume 5: Critical Essays: Edited By Noam Chomsky and Howard Zinn . First edition. Octav, original orange cloth. Fine in an excellent dust jacket that shows light wear to the spine extremities. Signed by both Noam Chomsky and Howard Zinn on the title page. Scarce in the cloth edition and signed. Failed States: The Abuse of Power and the Assault on Democracy. New York: Metropolitan Books, 2006. First edition of this work by Chomsky. Octavo, original half cloth. Boldly signed by Noam Chomsky on the title page. Fine in a fine dust jacket. Jacket design by Matthew Enderlin. New York: Pantheon Books, 1987. First edition of this collection of writings by Chomsky. Octavo, original half cloth. Inscribed by Noam Chomsky on the front free endpaper. Fine in a fine dust jacket. Edited by James Peck. The Hague: Mouton & Company, 1957. 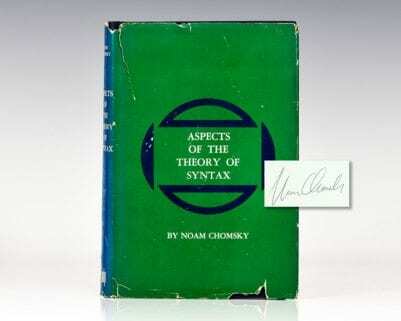 First edition of the Chomsky’s landmark first book. Octavo, original wrappers. Lengthily signed by the author on the title page with the added words, “Syntax is the study of the principle and processes by which sentences are constructed in particular languages Noam Chomsky.” Near fine in wrappers. Housed in a custom half morocco clamshell box. Most likely a unique example. First edition. Octavo, original orange wrappers as issued. Signed by both Noam Chomsky and Howard Zinn. Very good in wrappers.